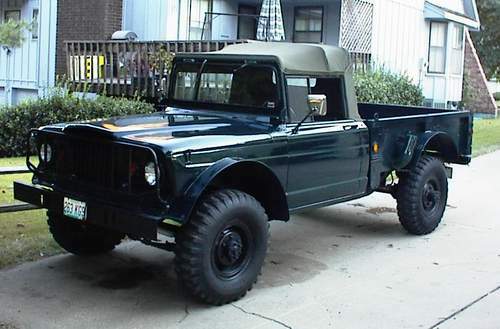 I own a 1968 Kaiser/Jeep M-715. I purchased it from a Military Surplus Company in Memphis,Tn. last year. It was in great condition, with no rust, and only 16K miles on it. I was unhappy with the sluggish performance of the stock 230 ci. engine, so I had a local shop put in a 375 horse chevy 350 ci. engine. Other up-grades include power steering, power brakes, carpeted interior and a newly re-upholstered bench seat taken out of a '71 J-Series truck. Other up-grades planned are 4.56 axle gears, new wheels and tires. I live in the Kansas City area.